The Tall Boy by Jeanne Simmons bring a new world modern take on an old world style in time. The Tall Boy shows refinement in the 4 3/4" inch crown with a 2" derby style brim. The frame of this hat is hard shelled for firm structure, with grosgrain band approx 1 1/2" inch wide. All of the sizes come with an adjustable tie on the inside. Crown is accented by a same color bow hat band. Brim is naturally turned upward. Fully lined inside with leopard print design. Made of 100% wool.Crown measures 4 inches deep. Brim measures 1 1/2 inches wide. Fitted with an adjustable elastic tie in the crown. 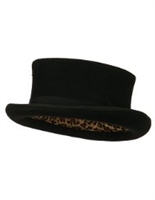 Bailey of Hollywood - Ice Top Hat 5" Crown with grosgrain ribbon bound trim. 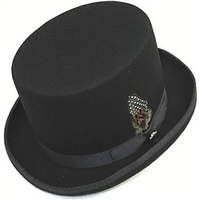 and incorporates a 2 1/8'' derby brim This tall crown captures the imagination and flaunts your modern worldly conventions on an old-world tour through time. Made of: 100% Wool. Cotton sweatband with removable side feather and "Bailey" side pin. The band is genuine leather with brass wheels and there are leather and brass accents at the top of the crown as well. There's even a secret compartment inside the crown.